After a post from Pat over at Critter Alley about a doggie riding in the back of the pick-up truck unsafely made me think about doggie safety while driving. The Pet Travel Center.com is a great resource for pet owners looking to travel with your critters. An air bag could easily kill a pet so please make sure your furiend is safe when you travel or even run errands! Since spring is coming I wanted to share another public safety announcement. There are many plants in the yard that are dangerous to your pets. Here’s a list. It’s long, but if your people think there are any of these plants in the yard have them print this out so they can be on the lookout. Also make sure that any fertilizer or pesticides are safe for pets. Last but not least if you use any decorative fencing in your yard, make sure there are no points on the top that your pets could impale themselves on and make sure if there are holes in the fencing that it’s not something that you pets could get stuck in. Everybody have a happy, healthy, muddy spring season! I thought I’d post this public service announcement. My mom person found this & thought she would share with all of you. Click here to see how to do animal CPR & the Heimlich maneuver on your pet. Print it out & keep it handy, just in case. 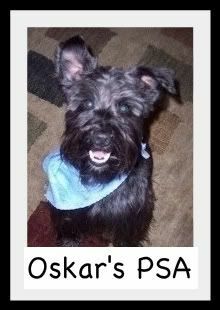 This public service announcement has been brought to you by me, Oskar!